I made this card from mostly scraps in my scrap bin :) I love being able to do that! Yes in fact everything but the base card is from there. If you don't already do that you ought to challenge yourself to give it a try and see what lovely work you can come up with. The bottom layer of "water" was from a background swap on a Yahoo group, I believe it was made by Lisa Gifford. I cut it with my wavy cutter on my Cutterpede and affixed it to the bottom of my base card. 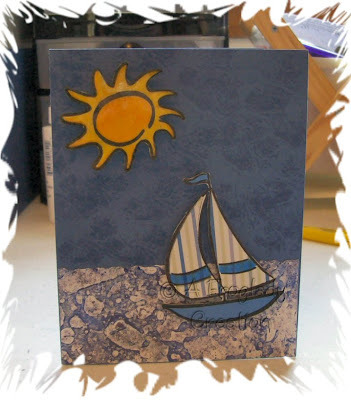 The sailboat was stamped with VersaFine Black Onyx Ink and then I cut it out with my Cutter Bee scissors. Very tricky since some parts of it are just the line :) I thought I might lose the flag for a minute so I had to hurry to stick it on the water LOL! 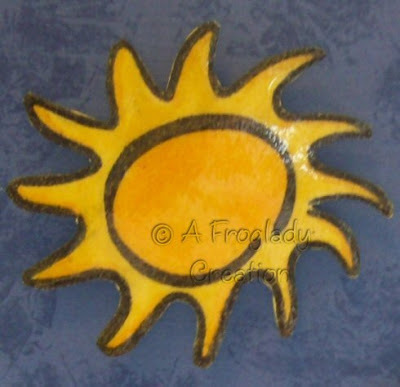 The sun also was stamped on white paper and then I used my Copic makers to color the outer edges with a light Yellowish one and then took a more Orangy one to add lines along some of the outer edge area and then also colored the middle in with it. I kept looking and looking at it and thought it needed little something still so then my 3D Crystal Lacquer fell over when I was opening one of my drawers to get my adhesive and I figured ok glaring sun while out on the ocean ....it works! i added the Crystal Lacquer to the entire sun after cutting it out too. As for the adhering of the parts well you can't just have a totally FLAT card when you are talking about sailing and moving water so I used different size of foam adhesive and you can see here in the following picture that the sun is out farthest (regular foam adhesive the excess from the dots) with the sailboat next (using the black super sticky from Jodys sale - look back for that one - hope you don't miss it!) and then the water flat against the card base. Thanks for looking in everyone - hope you have a wonderful day. This is fantastic! Reminds me of the scene I saw on lake Michigan yesterday - took the dog with me to the Library (on the waterfront) and she was mesmerized by all the sail boats!